I was saving this post for a rainy day, and today I thought "why not amuse myself and my blog friends today." So, hopefully I can entertain you for about five minutes. "I seem to have left my leg over there" So my face isn't that bad here, but what is happening with my leg?! This photo would be okay if it was an actual blooper, but the real problem is that I am posing like this. I think I was trying to make it look like I was walking. Fail. "That one time I tried to take photos in the back yard and my dog wouldn't get out of the way"
This is bad on so many levels. This was way back when I didn't know that taking a photo in front of a broken down fence wasn't a good look. Also, Eric wasn't home at the time, so I tried setting the camera on a chair, then I pushed the button and ran in front of it. And, well, Winston. What can I say? He loves the camera. "Oh, paparazzi, I did not know you would be here" Haha, oh man. I might have been trying to pose here. Just stop, Ashley, stop. "My wrist hurts and I'm over it" My wrist didn't ever hurt, just FYI. "The leather jacket went to my head and now I'm better than you" You have no idea how much I laugh when I see this picture. It gets me every.single.time. "My tongue/teeth itch" And this... this is the crowning glory. Apparently this face (or a version of it) happens quite regularly. Gotta keep the face loose, am I right? Upper left might be my favorite - it looks like my jaw got stuck and I need help getting it free. 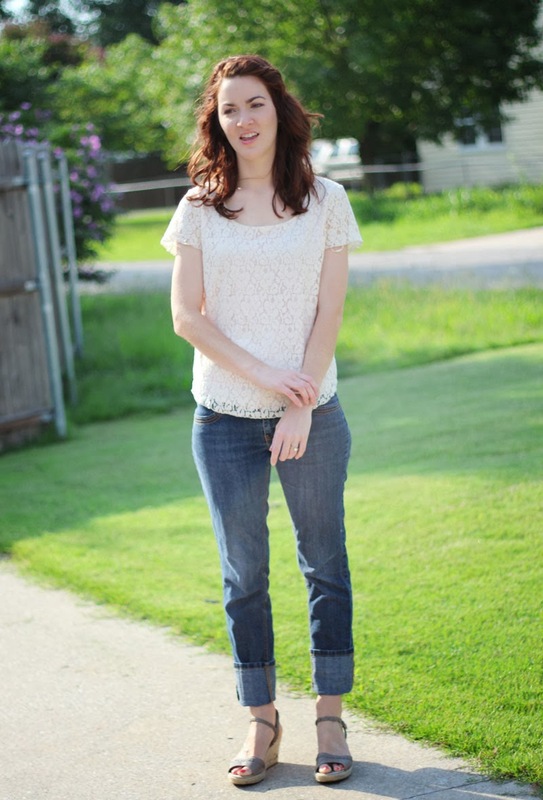 So, my friends, do you have a lot of outtakes when you take outfit photos (please tell me yes...)? THESE ARE AMAZING. Even your bloopers are cute though - I mean seriously you're adorable. And I love your style. Bahaha...every post I read of yours makes me like you and your blog more. The montage of four funny faces at the end is by far my favorite. I feel like most of my posts lately include at least one blooper. I can't control my face sometimes, and I'm glad to know I'm not the only one. I don't know why your leg is trying to run away from the first outfit because it's so wonderful. I love it. HAHA! I have soooo many horrible photos from these years of blogging, especially ones of me glaring at my boyfriend! Best Monday post EVER! And yeah, I have tons of bloopers in my photos - especially when my husband is playing photographer, because we are terrible at timing. I always think he took a picture, and then I change my pose, but he actually takes the picture when I am shifting. So there are a lot of really awkward ones! Sometimes he insists that I post one because it's so funny. Sometimes I do it. 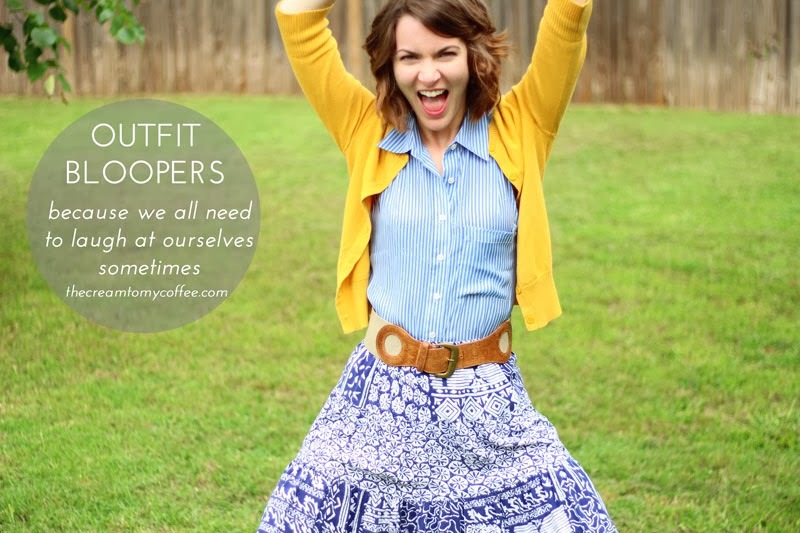 HA-I have been thinking about doing an outfit blooper post for awhile too! 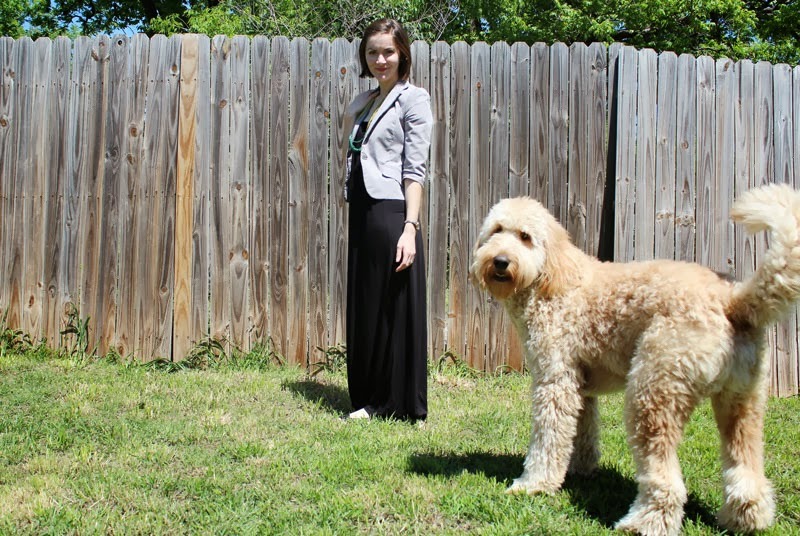 Your dog looks ginourmous in that one picture, I think it's the angle, like, you look tiny and he looks like a giant. And I love the leather jacket one too! Love the face collage! These are so funny! And yes, I frequently have horrible ones , too. You are adorable even in bloopers! hahaha!! I think every fashion blogger probably has a collection of shots like this! The one where you're pretending/attempting to walk is pretty hilarious! I always have TONS of outtakes! Thanks for sharing - they made me smile. Also thanks for linking up with Funday Monday! Ha! This is great! Love the leather jacket outtake! Love the leather jacket one! The last one is hilarious! If I took outfit pictured that would be like 99% of my pics. i love these kinds of posts. they always make me smile, especially because it's nice to know i'm not the only one with bloopers! Haha I love these! I have so many outtakes too. Sometimes I just feel so awkward when I'm taking my pictures and I have no idea how to stand or what to do! I have so many with my dog too! She always wants to be in my pictures! This post takes all the prizes for the day!! Haha, I love it! Outfit blooper shots are the best. I have quite a few... maybe I will do a blooper post in the future too! This is hilarious. I adore you for sharing. I'm doing one (been saving up the good photos...you know) for April Fool's Day. Gold, pure gold. Seriously, yours are too too great. Thanks for sharing! Hahaha, awesome. I always have been a fan of laughing at myself. It's harder to make fun of someone if they started it! And YES so many awkward pix come from my outfit pics! 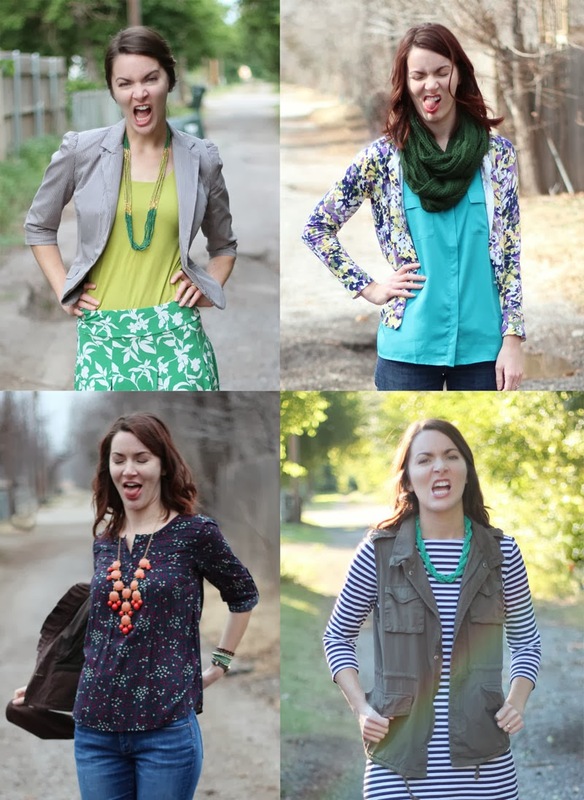 Hahah, I love outfit photo bloopers! That last set? I have plenty that look just like. You can't take yourself too seriously when you're doing something as silly (but like you said, fun) as taking outfit pictures! Loving the bloopers! Too cute! Hey Ashley. This is great. Really. I concur with your thoughts on what we wear not being important in the grand scheme of things, but that it is fun. 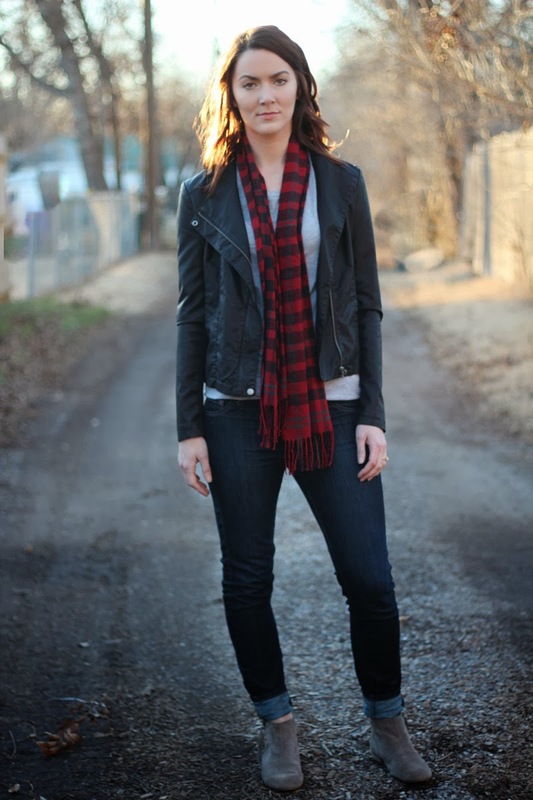 Fab post - my fav, is the leather jacket. Made me laugh too, b/c I've been guilty of this look many times! hahaha I also have a lot of these failed pictures! THIS...made my day. I'm just mad that you still look so cute in them! 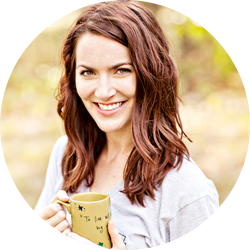 My unguarded expressions in my photo bloopers just seem to scream, "I LIKE CATS." what a fun post!!! i love the dog one so much! Oh man, this is great! I love your little face montage at the end. And yes, I have SO many outtakes when I take any pictures, even food pictures, and you know, the food just sits there. So I feel ya. Thank you for sharing! Haha this is so funny! The bloopers are so entertaining sometimes. I just can't be serious in a photo shoot, ever! Well thanks for giving us a good laugh, but kudos to you for sharing the bloopers. YES! These are absolutely freakin fantastic. Why can't more style bloggers post like this?! These are so bad/good and definitely got a chuckle or two from me! I so appreciate this! Sometimes I feel I have more outtakes than usable shots. But I'm always thankful I have at least 5 good ones. Thanks for sharing this! This post is HYSTERICAL and so, so beautiful! You know you're comfortable in your skin when you can laugh at yourself :) This is why I love you, girl! Hahaha these were great. I usually get rid of the outtakes before they even make it out of the camera. I have thousands of photos on my lap-top as it is. LOL Love them all especially the tough-look girl with the leather jacket and red plaid scarf. Great outfit btw.